It is exciting to talk about your latest stock picks and companies with exciting, cutting edge technology. 3D printers can actually make the framework for human cells to attach to and voila, you have made a viable organ for implant! But here is a chance to really impress your friends by sharing the the terminology used by the really smart money of municipal bonds…as an Institutional Municipal Bond Trader in the 1990’s, I learned the tricks of the trade while being wowed by the cool terminology. I did my best at a compilation – hope you enjoy! Accrued Interest – Interest that has been accumulate but not yet paid. If a bond pays interest every Feb 1st and Aug 1st and the bond changes hands on May 1st, the buyer will pay the seller half of the payment to be received on Aug 1, or the accumulated interest from the most recent payment on Feb 1 through the ownership transfer date of May 1st. Accretion – Accumulated valuation on discount bonds over time until maturity. If a 2 year bond is issued at 98 and matures at 100, the accreted value after one year will be approximately 99. Ad Valorem Taxes – Latin for “according to value,” these taxes are levied by municipalities on real property based on assessed values. Alternative Minimum Tax – In order to offset certain tax advantages available to higher income earners, the IRS ensures that they still contribute at least this flat-level tax calculation. Tax exempt interest from private activity bonds may trigger this tax liability. Amortization – The scheduled installments for a loan pay-off over time. Anticipation Note – Notes issued by municipalities against specific future revenue to be received (Revenue, Bond or Tax receipts also called RAN’s, BAN’s, and TAN’s). Baby Bond – Bonds issued in small face amounts targeted towards investors needing smaller denominations. South Carolina Santee-Cooper Mini Bonds are an example of a baby-bond issue. Bank Qualified – Commercial banks, under the Tax Reform Act of 1986, cannot deduct carrying costs of municipal bonds. Obligations of smaller issuers (under $10 million during the year) of tax free public use bonds, or bank qualified bonds, offer commercial banks that purchase them an 80% tax deduction. Barbell – A portfolio very heavily weighted with both short and long term bonds. Basis Point – 100 basis points = 1%. Blue List – Daily municipal bond inventory that was delivered in the morning of every trading day to participating dealers. The Blue List was printed on blue paper by Standard and Poor’s. Bond Insurance – Policies covering principal and interest payments in the event of a municipal default. American Municipal Bond Assurance Corporation, Municipal Bond Insurance Association, Financial Guaranty Insurance Company and Financial Security Assurance (AMBAC, MBIA, FGIC and FSA) are the original four big financial guarantors of municipal bonds. Call or Callable – Feature allowing issuer to redeem bond issues prior to maturity at certain dates or under certain circumstances. The most common use for a call feature is for the issuer to have flexibility to refinance the debt obligation if prevailing rates drop and they can refinance the debt at a lower interest cost. Some features, including catastrophic calls, extraordinary calls, and provisions of certificates of participation which are subject to approval of annual budget appropriations, allow issuers to redeem bonds early during times of duress or financial strain. Even non-callable bonds may have language within the official statement defining certain unique circumstances where the issuer may exercise early redemption features. Bonds may be called at par or at a different price. Coupon – The interest rate paid, usually semi-annually, on a municipal bond. Old bonds were issued in paper certificate form and the bearer would clip and submit coupons to the issuer to receive interest payments. Today bond are held electronically, and coupon refers to the interest paid on the face amount. Credit Rating – Agencies that evaluate the creditworthiness of municipal issuers include Moody’s, Standards and Poor’s, Fitch and White’s. Typically the ratings start at AAA and have three gradations per letter. Investment grade ends at BBB, junk starts at B or CCC, and bonds in default or those that are late or have missed interest or principal payments are rated as D. Rating agencies also may put issuers on either positive or negative watch for potential changes. Smaller municipalities often cannot afford to pay the agencies to issue ratings on their debt, and thus will be “non-rated” or NR. WR indicates that a rating agency has withdrawn it rating, which occurs for a variety of reasons. Default – Issuers who are late or miss interest or principal payments. Many defaults are created by short-term financial challenges, and bondholders ultimately receive their payments. If a bond is trading flat, this means it does not transfer with accrued interest because the issuer has missed payments. Defease – Notice of defeasement means that the issuer has set aside funds to pay off the outstanding bond issue. Most commonly the municipality will establish an escrow account of U.S. government securities specifically designated to pay off the specified bond issue, also known as escrowed to maturity. Normally this enhances the underlying creditworthiness of the bond. Discount – Bonds that trade below par or $1,000 per face value. Double-Barrelled – Bonds that are backed by two sources of monies, such as the revenue from a specific project and the full faith and taxing power of the issuer. General Obligation – Issues backed by the full faith and moral obligation of the municipality. Bonds that are secured by unlimited taxing authority are often referred to as indentures, while unsecured issues are called debentures. Interest Rate Risk – If prevailing interest rates rise, the value of outstanding bonds will drop. Kicker – High coupon premium bonds with call features that have a lower yield to call. If the issuer fails to redeem the bond early, the yield goes up or “kicks” to maturity. Limited Tax Bond – Bonds that are backed by only certain taxes or levels of tax only up to a maximum amount. Limited tax bonds are not as secure as general obligation bonds. Marked to Market – Pricing of bonds to reflect current market conditions. Maturity – The due date of a debt issue when bondholders will receive their return of principal. Municipal Securities Rulemaking Board – MSRB is the self-regulatory board that sets rules and oversees the regulation of the municipal bond market underwriters and dealers in conjunction with the Securities and Exchange Commission. Municipal Bond Index – Indexes used to monitor and benchmark the overall performance of the municipal bond market include the Barclays Municipal Index, Bond Buyer Municipal Bond Index of 40 GO’s and revenue bonds, and the Bond Buyer 20 Bond Index of 20 municipal GO Bonds. Municipal Utility District – MUD bonds are issued to finance essential purpose services such as water and sewer facilities within special taxing districts. As an example, SMUD is the Sacramento Municipal Utility District which has provided electric services to Sacramento county and a few small neighboring counties since 1946, and is owned by its customers. New Issue – Bonds that are available on the primary market, which are in the process of being underwritten. A syndicate, or group of municipal dealers, will participate together to sell the bonds or raise money for the debt offering of a municipality. Official Statement – The document that provides general information, financial data and required disclosures about a new issue of a municipal bond. The OS may be generated by the actual municipal issuer or by a legal or financial professional on their behalf. Original Issue Discount – OID bonds are issued at a discount to par. OID bonds include zero coupon bonds, but also include coupon bonds issued at a slight discount to par, which boosts yield to maturity over the stated coupon. Par Value – Refers to the face value of a bond, normally $1,000 trading in minimum lots of five or 5m for municipal bonds. Bonds that are priced over par value are called premium bonds and those trading below par value are called discount bonds. Pre-Refunding – Bonds that the issuer has decided to redeem early, normally by having established an escrow account with funds designated to pay off the outstanding debt. Issuers may also schedule the refinancing of such a called bond by issue replacement debt, normally at a lower interest rate. Premium – Bonds that trade above par or $1,000 per face value. Revenue Bond – Debt issued for projects where the bond principal and interest payments are specifically backed from revenues from certain sources such as water and sewer facilities, toll-roads, hospitals and healthcare facilities, or public housing. Special assessment bonds are revenue bonds backed by excise taxes on items such as hospitality, gasoline and alcohol. Municipalities may issue bonds to build infrastructure that benefits a private company, in which case the IRS may disallow the tax-exempt status of the bond. These bonds are referred to as Industrial Revenue bonds. Sinking Fund – A bond indenture may call for monies to be collected over the life of a bond to ensure its payoff. Bonds that have designated accounts or sinking funds typically have a higher level of credit quality. Taxable Municipal Bond – Municipal bonds that finance private activity may be subject to federal and/or state taxation. From 2009-2010, special tax credits were made available by the federal government to municipalities issuing debt as a way to reduce overall borrowing costs credits. Tobacco Bond – In the late 1990′s, some of the major tobacco companies and most U.S. states signed a settlement agreement to resolve ongoing lawsuits and disputes over costs associated with illnesses caused by smoking. As one part of the settlement, the tobacco companies agreed to make payments to help the states cover Medicaid costs for patients with smoking related illnesses. Many states issued bonds securitized by the future payments to be received from the tobacco companies. Visible Supply – Issued by the Bond Buyer, the scheduled municipal debt to be issued over the next 30 days indicates the direction of overall supply and potential pricing of the bond market. When Issued – Bonds that have been authorized sand are available in the primary market that are trading “when, as and if issued.” Technically the bonds have not yet been issued, but can be secured and traded in advance of the target issue date. Yield Curve Spread – The comparison of U.S. government bonds yields versus municipal yields across various maturities shows the variation or spread between the two. Yield to Maturity – Calculates the overall yield taking into account the price (discount or premium) of the bond and coupons to be received over time. Bonds at priced par will have a yield to maturity that equals the coupon rate. Zero Coupon Bond – Bonds issued at a deep discount, mature at full face value and pay zero interest over the life of the bond. Starting in the 19080’s, broker-dealers removed the interest coupons from bonds and re-issued the body of the bond as a zero coupon bonds, but today zero coupon bonds are issued in the primary market. 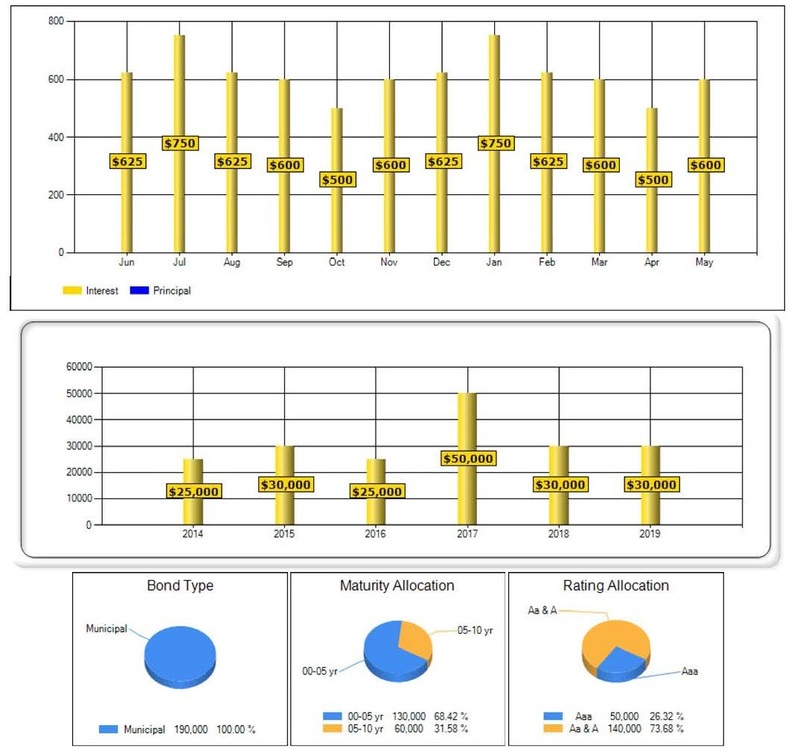 The first chart below shows the monthly cash flow from the portfolio, the second shows the principal amount maturing each year, and the pie charts break down the overall ratings and maturity dates. The total par value of this portfolio is $190,000, but because the coupon rates are higher than prevailing market rates, the dollar cost is $207,230. The average duration (please see my previous article defining duration) is quite low at 3.057 for all six bonds. In 2014 when the first bond returns principle, the monies will be reinvested into another South Carolina municipal bond maturing in 2020 at the far end of the ladder, and so forth going forward each year. This strategy gives you the opportunity to, over time, obtain higher yields to maturity while having funds coming due each year for liquidity purposes. Structure for the fixed income portion of your portfolio is just as important as structuring your equity holdings. The most volatile bonds are long-term, low-rated zero coupon bonds. The City of Greenville rating was upgraded to AAA in 2011, the highest attainable level. This bond is very short-term, has a high rating, and pays coupon interest. Any changes in interest rates would have little affect on the price of this issue because is a short-term, high quality bond. In the late 1990’s, some of the major tobacco companies and most U.S. states signed a settlement agreement to resolve ongoing lawsuits and disputes over costs associated with illnesses caused by smoking. As one part of the settlement, the tobacco companies agreed to make payments to help the states cover Medicaid costs for patients with smoking related illnesses. Virginia is one of many states that issued bonds securitized by the future payments to be received from the tobacco companies. These bonds have faced trouble for some time now, because the payment calculations are based on a per unit sold formula, and smoking rates have decreased steadily since the settlement. The payments have been shrinking, and now many states do not have money coming in to pay back the holders of the tobacco municipal bonds. Unlike the City of Greenville SC bond, the Virginia tobacco bond has a very long maturity date, only pays interest at maturity, and has a low credit rating of CCC+. This value of this bond will fluctuate wildly in a changing interest rate environment. In summary, please feel free to solve for Macaulay’s formula on your bonds, and if you do I would love to see the math and will even post it to the site! For the rest of us, we will stick to common sense and know that the least volatile bonds have high credit ratings, good coupon rates and short-term maturities.